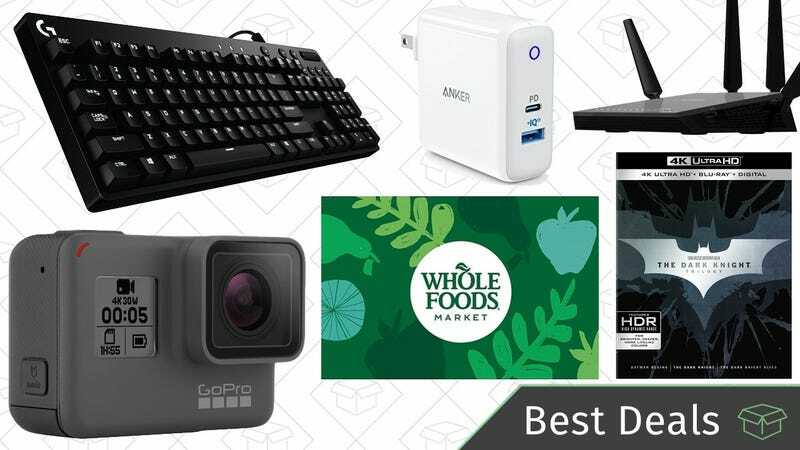 A massive PC gaming gear sale from Amazon, a deeply discounted GoPro, and a bunch of Anker USB-C charging gear leads off Monday’s best deals from around the web. Bookmark Kinja Deals and follow us on Twitter to never miss a deal. Amazon’s kicking off the week with a gaming peripheral and PC part Gold Box, but there are deals in here for gamers and non-gamers alike. Gaming monitors and pre-built gaming PCs lead off the sale, but scroll down the page, and you’ll find mechanical keyboards, PC parts, wireless routers, and even a few external hard drives that anyone could make use of. Head over to Amazon to see all of the deals. The GoPro Hero5 Black is no longer the latest and greatest—the Hero6 can shoot 4K/60 rather than just 4K/30, for example—but it’s still a terrific action camera with enough features to please nearly every adrenaline junkie. And at $220 (compared to $400 for the Hero6), it’s an absolute steal. Just note that you won’t see that price until you add it to your cart. While supplies last on Amazon (which probably won’t be long), $48 gets you a refurbished T-Mobile AC1900 router, which is actually just a rebranded version of the $140 ASUS RT-AC68U, which is our readers’ favorite router. The T-Mobile version has some T-Mobile branding, and uses custom firmware that claims to be optimized for Wi-Fi calling, but under the hood, it’s just a standard (and very popular) Wi-Fi router. You can even flash the firmware and install the original ASUS version, or a third party solution, if you wanted to put in the work. Just check out the customer reviews for ideas. Wi-Fi range extenders can’t work miracles, but if there’s one spot in your house with spotty coverage, they can be a much cheaper solution than buying a new router. So at $24, why not give this one a try? Just clip the $5 coupon to get the deal at checkout. USB-C is eating the world, and you can manage the transition with a bunch of great sales from Anker this week. The most exciting deal is a brand new product: the Anker PowerPort II with Power Delivery. This is similar to the 30W USB-C PD charger they’ve sold for awhile, but with an extra Quick Charge-compartible USB port for your other devices as well. Get it for $25 with code ANKEBEST. Need more ports? Get the 5-port USB-C PD hub for $38 with promo code ANKEBEST. Just like the PowerPort II above, this will charge a 12" MacBook or Nintendo Switch (in portable mode) at full speed. Of course, none of these would be very useful without cables. The PowerLine II USB-C to C cables (3' | 6') support 60W charging and come with a lifetime warranty, while the PowerLine+ USB 3.0 to C cable is wrapped in premium nylon. This tiny, $6 USB charger isn’t much bigger than the one that ships with every iPhone, except it has two ports, folding prongs, and 2.4A of total power, compared to the 1A Apple gives you. No surprise, it’s one of our top sellers of all time. Just use promo code AUKEYA32 to get the deal. It’s not one of the high-end models with GPS or LTE, but $150 for an Apple Watch Series 1 is one of the best deals we’ve ever seen on Apple’s increasingly popular wearable. Somewhat confusingly, the Series 1 is not quite the same as the original Apple Watch, as it has a second generation chip for faster performance. This deal is only available on the smaller 38mm watch, but we still suspect it will sell out soon. The UE Wonderboom is an adorable little speaker that punches above its weight in both sound quality and features, packing in IPX7 water resistance, 360 degree sound, and even multi-room audio with other UE speakers. It offers a good value proposition at its $100 MSRP, but at $60, it’s a no-brainer. You even get to pick from a bunch of different colors. Aukey’s simple magnetic smartphone vent holder is one of the most popular car mounts out there, and from personal experience, I can tell you it’s awesome for taking on vacation for use in a rental car as well. For $6, go ahead, give it a try. There’s not a whole lot to say here: This phone stand has a nearly perfect review average form almost 7,000 customers, looks great, and is only $6 today with code 7LM3H6FB. Why wouldn’t you put one on your desk? At $26 (with code ETDWL58B), this smart power strip costs about as much as a standard smart plug, but it includes four smart AC outlets that you can control individually with your smartphone or Alexa, plus four USB ports too (though you can only control them as a set). Why has nobody else thought to make this yet? The free control app and Alexa will recognize the power strip as six different devices (four AC outlets, the USB ports, and the entire power strip), all of which you can name and control from anywhere. Update: Promo code VOGEK136 works now. We’ve seen other oversized mouse pads before, but I have to say, built-in leather kickstands for your phone are a pretty unique touch. They fold flat into the mat when you don’t need them too, so your mouse can glide unabated. Use promo code VOGEK136 to get it for $15. As good as they were when they launched a few years ago (and they are very good), Bang & Olufsen’s Beoplay H7 over-ear Bluetooth headphones were a tough sell at their original $450 price tag. But now, the street price on them is a much more palatable $250, and our readers can save an extra $50 on a pair with promo code KINJA15B (must purchase from Roberts LP via Amazon). DirecTV Now is one of the better over-the-top cable replacements out there, and with this deal, there’s very little reason not to give it a try. For a limited time, if you prepay for three months of the service at $35 per month, you’ll get a 4K Apple TV included for free. That Apple TV costs $179 normally, so you’re basically getting a $74 discount on the box, plus three months of live TV. No brainer. VPNs have been in the news, and whether you want to get around video geoblocks, circumvent proxy filters, or just keep prying eyes out of your browsing data while using sketchy public Wi-Fi, reader-favorite Private Internet Access has a deal to fit your needs. These deals are only for our readers, but we aren’t sure how long they’ll be available, so go ahead and sign up while you can. What’s better than 5% off at Whole Foods? 10% off at Whole Foods. That’s effectively what you’re getting with this $100 gift card, on sale for $90 from Staples. The area under your bed is valuable storage space, and this soft-sided containerorganizes your linens to slide under your mattress. Obviously, there are plastic containers out there designed to do the same thing, but the zipper closure on this model is better at compressing linens if you stuff a lot in there, and its striped sides won’t look too utilitarian if you can see it from certain angles in your bedroom. Get it for $13 with promo code A28FHM4F. Spending $480 on a espresso machine might sound indulgent, but when you add up all the money you spend at coffee shops, buying this Breville Barista Express might save you money over time. I bought this exact machine (refurbished) about 6 months ago, and I can’t imagine mornings without it. It grinds the beans and dispenses the perfect amount for each shot, making it pretty much idiot proof. And, it makes vastly better-tasting coffee than the less expensive machine I had before. So, if you’ve eyeing an espresso machine for a while, this one has my vote. You don’t need to buy a new car to get a life-changing backup camera, you just need $76 (with promo code Q88XKGN3), and a few minutes to run the wires. This model attaches to your license plate, and runs to a special rear view mirror that attaches in front of your existing mirror. Oh, about that mirror...it has a dash cam built into it! Just pop in a microSD card, and you have a backup camera, plus a dual-lens dash cam to record any accidents. Feel like getting out of town, but don’t know where yet? Check out Alaska Airlines’ latest flight sale, with one-way tickets starting at $49 from dozens of cities. I clicked around a few random deals, and the lowest prices were available for a surprising amount of dates, so you should be able to find a deal that fits your schedule. It’s a no-brainer adding this $19 Calpalon 8" fry pan. With a classic construction, stay-cool handle, and easy-to-clean ceramic coating, it just makes sense to have this workhorse pan in your pantry. Typically selling for $14, you can grab yourself a two-pack of Amazon’s best-selling silicone baking mats for $10. If you haven’t used one before, you should now that nothing will stick to these. They’re made of silicone, flexible, and fit onto standard-sized baking sheets, making clean up a breeze. Plus, since you won’t be baking nonstick spray into your cookie sheets, they’ll look like new for longer. In addition to being bestsellers, these mats boast a near-perfect 4.6-star rating with over 2,000 reviews. We love Kikkerland’s tiny concrete desk planters, and this pen holder model is down to an all-time low $13 today on Amazon. It doesn’t include a plant, so you’ll need to pick that out separately, but I’d avoid cacti for reasons that should be obvious. Don’t be that guy that doesn’t clean up after his dog. When you can get 810 poop bags and a dispenser for $13, there’s no excuse. If you want save another 64 cents, sign up for Subscribe & Save and cancel at anytime. It’s 2017, and your lighter doesn’t need fuel anymore, it just needs to recharge over USB. This flexible neck model is just $10 with code TEKPK6SU, is perfectly designed for lighting candles, and can spark 400 times on a charge from its 220mAh battery. And in case you missed it last week, our favorite arc lighter, the Power Practical Sparkr Mini, is still down to $19 with code L5IMQBFO. This is an updated model of the Sparkr which fixes an issue that caused the its flashlight to turn on in your pocket, and it also doesn’t make a high-pitched whine like most competing products. What if you could apply a coat of Rain-X to your car just by pulling on your windshield wiper stalk? This bottle of washer fluid additive is just $4 today after you clip the $1 coupon, and mixes with your existing washer fluid to encourage water beading. And with a 4.3 star review average from over 450 customers, it seems to actually get the job done. This vacation package is basically your chance to recreate the movie Sideways, except in Portugal, and hopefully less melancholy. Rates start at $1,474 per person (prices vary based on departure date and airport), and include roundtrip flights to Portugal, six hotel nights across three different cities, breakfasts, a rental car, some wine tastings, and even a river cruise. Just make sure you bring a suitcase big enough to fit a few bottles of vinho for your trip back. It shouldn’t be a surprise that Banana Republic, Old Navy, and GAP are in cahoots when it comes to sales; they are owned by the same company, after all. But with 40% off everything (and I mean everything. Jeans, sale items, everything) coming from all three retailers when you use the code STYLE, maybe you get a whole new wardrobe by the end of spring. Note: There’s also an extra 10% off at GAP with the code BONUS that stacks. It’s finally light enough after work to feel like you can go outside. And if you’ve been putting off going to the gym because the weather’s bad, time to give up. It’s getting nicer and nicer each day, and PUMA is taking an extra 30% off sale items with the code SPRINGSALE. Let’s just say your wardrobe will look like it’s ready to hit the gym, even if you aren’t. Give someone the gift of drinking in the woods with this pair of deals from Stanley. Add a growler and four cups to your outdoor arsenal for $45, or slim down your carry to just a flask and a shot glass set for just $22. Imbibe on alcohol anywhere. David Archy might not be a brand you’ve heard of, but they make some seriously great underwear and other basics, and their highly rated robes and leggings are on sale right now on Amazon. Robes start at just $22, and leggings for men and women are even cheaper. You can always use a new pair of socks, so why not grab eight pairs for less than a dollar each? Pick up an 8-pack of no-show or dress crew socks for just $10, which means you can afford to lose one in the dryer or under your bed. Update: Temporarily out of stock, but you can still order it for this price, and get it once Amazon has more available. We didn’t think Philips OneBlade deals could get better than the $17 price tag we saw around Black Friday, but I think this actually has it beat. Amazon’s currently listing the OneBlade plus two replacement blades for just $27 after a $10 coupon is applied at checkout. That’s $8 less than the regular price of the OneBlade by itself, with no replacements. And even if you already own a OneBlade, this is only $2 more than buying two replacement heads by themselves, and you’re actually getting three blades, plus another shaver. If you aren’t familiar with this thing yet, Shane shared his thoughts about it on Gear. Update: You can get the three films separately with this 3-for-$50 deal from Best Buy. You don’t need Bruce Wayne’s fortune to afford the Dark Knight trilogy today. This UHD Blu-ray set includes all three Chris Nolan Batman films in 4K, along with regular 1080p Blu-rays, plus digital copies. At $70, it’s never been cheaper. Legend of Korra was one of the best shows on TV during its time, let alone one of the best anime series, and you can own all four seasons on Blu-ray for an all-time low $24, courtesy of Amazon. Amazon’s one-day Easter toy sale isn’t the most exciting toy sale they’ve ever offered, but it’s worth a browse whether you have kids or not. Or celebrate Easter or not, for that matter. Highlights include a Nerf gun, Play-Doh, a Rubik’s cube, and several board games. As you might expect, these aren’t obscure German board games where you maximize wheat yields or anything like that...we’re talking Monopoly, Chutes & Ladders, and the like. But hey, everyone should at least own a copy of Scrabble. This deal isn’t quite as good as the $50 cash discount we saw on Black Friday, but for a limited time, if you buy an Oculus Rift VR headset with controllers, you’ll get a $50 Oculus store credit to spend on games and VR experiences. Just make sure you still see the promotion in the “Special Offers and product promotions” section of the Amazon page before you order. If you liked F-Zero, you’ll like Redout, and you’ll especially like it with today’s deal from Chrono.gg. They have it for just $10, compared to $17 on Steam (which is actually on sale, it’s normally $35). The only catch? This deal is only available until noon tomorrow, so race over there to get a copy. Assassin’s Creed Origins is largely a return to form for the series, and you can pick it up for just $30 on Amazon today for both PS4 and Xbox One. At the very least, you can use it as an interactive museum of ancient Egypt. Update: I wasn’t aware of this before posting this deal, but apparently, the latest Switch update is causing some third party docks to brick Switch consoles. It seems the issue primarily affects Nyko products, but proceed with caution. The Nintendo Switch’s dock isn’t what I’d call travel friendly, but this inexpensive dongle performs most of the same functions, and can fit in any travel bag. Just plug the USB-C connector into your Switch, and you’ll have access to a USB port, an HDMI output, and a USB-C passthrough port for power, all for just $31 after you clip the 5% coupon, down from its usual $35. I probably wouldn’t want to use it as my main dock, but it’d be perfect for a secondary TV in the house, or for bringing along to a hotel. I know it looks ridiculous, but a gooseneck tablet stand really is the best way to play your Switch in bed. Get one for $11 from uGreen today with promo code 9HV88DWK. The Switch Pro controller isn’t just one of the best ways to control your Nintendo Switch, it might be one of the best gamepads ever made, period. If you have a Switch and still haven’t picked one up, $59 is within $9 of the best price we’ve seen, and a solid $10 less than usual.